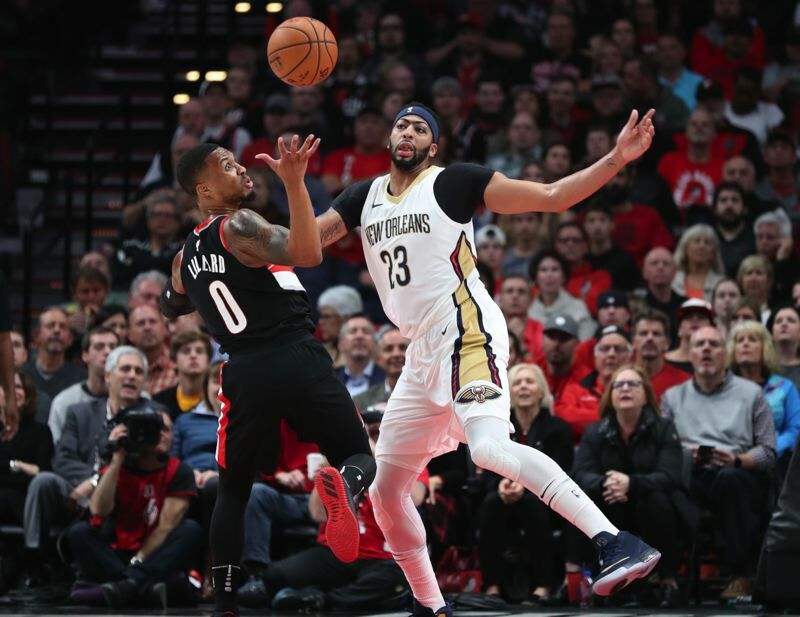 The playoffs are often about matchups, and the matchups will be significant and, potentially, intriguing as the Trail Blazers play host to New Orleans in the opener of their best-of-seven first-round series Saturday night at Moda Center. There is Portland's potent pair of guards, Damian Lillard and CJ McCollum, matched up against the Pelicans' bodacious backcourt duo, Jrue Holiday and Rajon Rondo. There is New Orleans' scintillating big man, Anthony Davis, the reigning Western Conference Player of the Month. He'll be going against the Blazers' 7-foot Jusuf Nurkic, or 6-9 Al-Farouq "Chief" Aminu, and anyone else coach Terry Stotts chooses to throw at the player who is in the conversation for the NBA's Most Valuable Player Award. Or maybe it will be the other starters — Portland small forward Evan Turner, and New Orleans' Nikola Mirotic or E'Twaun Moore — who will make the difference in the series. Or perhaps someone off the bench — Blazers Ed Davis, Zach Collins or Shabazz Napier, Pelicans Darius Miller, Solomon Hill or Ian Clark — who will tip the scales his team's way. The teams split four games during the regular season, and the New Orleans lineup was different each time. Center DeMarcus Cousins was a beast in each of the first three games, averaging 33.7 points and 13.3 rebounds before going down with a season-ending Achilles tendon injury in late January. Davis played only five minutes in the first game before leaving with a knee injury and missed the second game with a pelvic injury. Rondo sat out the first game with a sports hernia and the last game with a sprained wrist. Mirotic played in only the last game after coming over in a Feb. 2 trade with Chicago, and that was in a bench role. So the Pelicans will have the full cast aboard, sans Cousins, for the first time against Portland in Game 1 at 7:30 p.m. Saturday. It's a formidable group, one employing a different style in the post-Cousins era. After Cousins went down, coach Alvin Gentry took the brakes off the offense and handed the keys to Rondo. "It played right into my hands," said Rondo, 32, who quarterbacked Boston to an NBA title in 2010 and has been a starter in 96 playoff games. "I'm a guy who likes to get the ball, push the pace and set the tone each game." Rondo, not the easiest guy for a coach to get along with, is playing for his fifth team in five years. But the four-time All-Star has had an excellent season under Gentry, averaging 11.3 points and 8.2 assists while shooting .468 from the field. "He may be the smartest player I've ever coached," Gentry said. "He has a great feel for the game, a great feel offensively, getting the ball in the right positions. He's a coach on the floor. He figures out a lot of things and puts us in good situations." Turner said Rondo is particularly valuable in a playoff series. "Give him a minute and he's good," Turner said. "Give him an hour and he's great. Give him a whole day to prepare and he can't miss in situations like this." After Cousins was lost, the Pelicans averaged the most possessions in the league (104.5) and a league-high in fast-break points (19.1). Davis averaged a league-high 30.2 points over the final 33 games, shooting .514 from the field and averaging 11.9 rebounds, sixth best in that span. Over the Pelicans' season-ending five-game win streak, Mirotic averaged 25.8 points and 12 rebounds per game. "They've rallied around 'Boogie' (Cousins), wanting to win for him," McCollum said. "And (Davis) is a player capable of carrying the load by himself. Now with the players they have around him, they haven't missed a beat. Defensively, they've been better. Offensively, the pace has been faster." The 6-11 Davis finished second in the NBA in scoring at 28.1 points per game, was fifth in rebounds (11.1) and led the league in efficiency rating at 33.0. After Cousins was lost for the season, Davis carried the load for a New Orleans team that went 20-8 since Feb. 10. "Losing a player like DeMarcus changes your team, but they still have Anthony Davis out there," Lillard said. "That's a good problem to have. "He's one of the very best players in our league. Anybody guarding him is going to have a tough time. He can handle the ball, shoots the 3, hit pull-ups and floaters and go coast to coast." Stotts is expected to start Nurkic on Davis, who had 36-point games in the two full contests he played against the Blazers this season. Aminu also is likely to get some time guarding his former teammate. Davis and Aminu played two seasons together in New Orleans in 2012-13 and 2013-14. "Chief has the height and length to do a good job on (Davis)," Lillard said. "Plus he has the understanding how to guard guys, and he played with him, so he's familiar with his tendencies. But it's going to take a team effort. We're going to have to be ready to play physical with him." Nurkic knows he won't be able to contain Davis by himself. "There are a lot of good players in this league," Nurkic said. "He's one of them. I'm not worried about Anthony Davis. He's going to make his shots. He's probably going to get his points. We need to worry about the rest of the team. Some of the other guys, like Mirotic, can have an impact. I'm more worried about one of those guys getting hot, because they have a lot of shooters." Lillard tied for fourth in the NBA in scoring at 26.9 points per game, was 10th in assists (6.6) and 11th in efficiency rating at 25.0. He combines with McCollum (21.4-point average, 19th in the NBA) to form one of the most potent backcourt combinations in the league. Gentry could choose to use either the 6-1 Rondo or the 6-4 Holiday to guard Lillard. Whoever it is will also require help. "You have to work as hard as you can defensively and hope they are not having one of those great nights they're capable of having," Gentry said. "'Dame' is one of the best clutch players in the league. I feel like he's been an All-Star the last five, six years. He has a way about him, a confidence about him, that he feels like when his team needs a basket the most, he can go get it." "Damian Lillard is not going to be stopped by one guard," Nurkic said. "They need the whole team to defend him. Same thing for us with (Davis). We need everybody to step up and do their job to win the game." Holiday, still only 27 though in his eighth NBA season, had the best year of his career, averaging 19.0 points and 6.0 assists while shooting .494 from the field. Turner said Holiday is one of his best friends, from their season together in Philadelphia in 2012-13. "Jrue is somebody who goes unnoticed, but kills all the time," Turner said. "He's a problem. Jrue and Rondo are two players we have to look out for." Lillard has respect for the New Orleans guards, but confidence going against them, too. "Those two are really good defenders. and they're smart defenders, as well," Lillard said. "But I've played against both of them a lot, being in the league for six years. It's always a challenge, but it's nothing I haven't seen before. "Part of (playing against them) is making them work at the other end. Rondo handles the ball a lot. He's a great playmaker. He spends a lot of time running the team. With (Rondo and Holliday) if you wear them down at the defensive end, maybe they don't have as much energy." Turner started the final eight regular-season games in place of Moe Harkless, who underwent knee surgery on March 27. Harkless, not yet going five-on-five but working back into form, has been ruled out Saturday night. Best bet is he may return for Thursday's Game 3 at New Orleans. "Moe will be back as soon as possible," Nurkic said. "When we have everybody healthy, we can do great things. We showed that through the (regular season). We really believe in what we have." Nurkic played sparingly in last year's playoff series with Golden State after suffering a broken leg late in the regular season. He is healthy going into this year's playoffs, having averaged 14.3 points and 9.0 rebounds while providing interior defense the Blazers haven't had in the starting lineup for several seasons. "It's huge for us to have a guy who takes up that much space and will protect the rim," Lillard said. "We're able to throw the ball to him, and he can make plays and score from the block. He can wear on (defenses), banging guys." "It was disappointing last year, getting injured at the wrong time," Nurkic said. "I'm really excited to be in the position I am right now. It was great be in the position to start every night. Your teammates expect you to bring it every night. But I know it's not done. We have a job to do." A playoff series is a different animal than the regular season, when a team is rarely playing an opponent twice in a row, much less in as many as seven games in a two-week period. "I like it," Lillard said of a best-of-seven series. "It makes the players play. You have the ball, and you have to make things happen. "It's not like we have to play (the Pelicans) and then go to Golden State (the next day). This is all we have to worry about. Players have to get it done. I love that part of it. When the playoffs come around, this is the only thing I'm putting my time and energy to." As the No. 6 seed starting the playoffs on the road, New Orleans is the underdog in this series. Davis said he holds great respect for the Blazers, but that the Pelicans aren't going to be happy to just be in the playoffs. "It starts with their guards," he said. "They are a handful. They can score at will. They're a good defensive team. We have to make sure we don't turn the ball over. Take care of the defensive boards and play defense. "Our goal is to not just get in the playoffs, but to make some noise. We want to try to get one, maybe both, of the games (in Portland), then go back home and take care of business." The Pelicans are a dangerous opponent for the Blazers, but not one they will overlook. Both teams have been good road teams this season. New Orleans is 24-17 away from home, Portland 21-20. New Orleans would love to steal one of the first two games at Moda Center and head back to Smoothie King Center tied 1-1. Portland intends to protect homecourt and fly south with a 2-0 advantage, needing only to win two of the final five contests to advance. The Pelicans ranked third in the NBA in fast-break points this season at 15.3 per game. The Blazers were last at 8.1. Portland can't afford to let New Orleans get seven more easy transition points per game in this series. The Blazers need to get back on defense and also push things at time to score on the fly, too. Overall defense will be critical for Portland against a New Orleans team that was No. 2 in the league in field-goal percentage (.463) and fourth in scoring (111.6). The teams shoot the same percentage from 3-point range (.366). That's a weapon the Blazers need to employ. Lillard and McCollum must do some damage from distance, and players such as Aminu, Napier and Pat Connaughton must help out in that area. If Harkless can return healthy in the middle of the series, that will be a bonus. If not, Turner must give the Blazers consistently good play at both ends of the court, which he is capable of doing. Nurkic is a key. The "good Nurk" must show up more than the bad one. He has to finish around the rim and defend in the paint at the other end, and do his part to limiting Davis to something close to mortal production. I see the Blazers winning the first two games, splitting a pair at New Orleans and then wrapping things up at home in Game 5. Then it will be on to a Western Conference semifinal series against Golden State — if the Warriors can get that far.